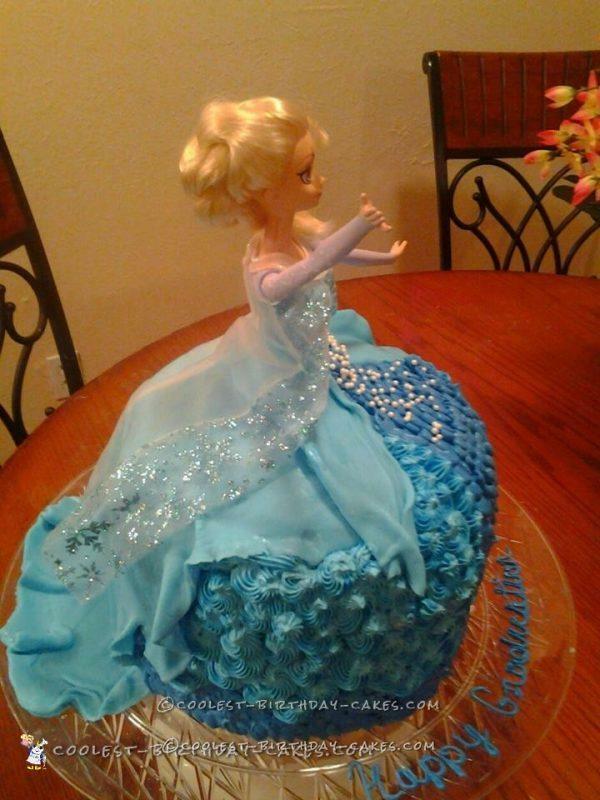 I was asked by a co-worker to make an Elsa dress cake for her daughter’s pre-K graduation. The cake was going to be a surprise, so of course I had to make it fabulous! I made a regular doll dress shaped vanilla cake (Pillsbury traditional vanilla cake mix), blue colored swiss meringue buttercream (my go to icing), and a little homemade fondant (google or youtube: michelle foster’s fondant) slightly tinted blue. For the dark blue ruffles I used royal blue Wilton gel food color, and Wilton tip 102. For the swirls I used Wilton sky blue gel food color and Wilton tip 32. After a quick crumb coat, I popped the cake back in the fridge and rolled out the fondant to a long oval shape. I didn’t want the dress to be perfect. I wanted it to have pleats, and jagged ruffles (thinking of Elsa, cold, snow, ice, etc.). After the crumb coat, I placed the doll in the cake (Saran wrap covering her legs) and then did the frosting details in the front. 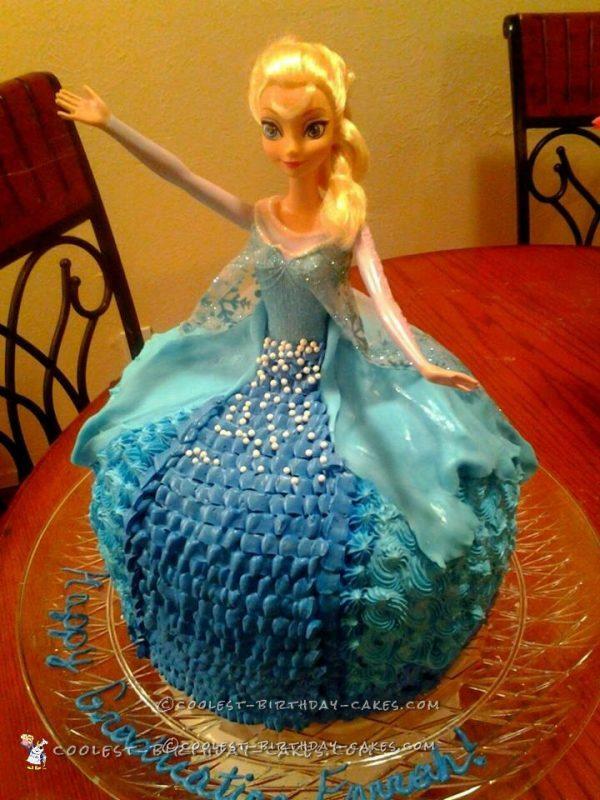 Next, I placed the fondant as the train of the dress and let it fall wherever it wanted to naturally. I then added Elsa’s glitter cape that came with the doll for the extra sparkle! I found a $1.00 cake base at my local Dollar Tree store. I thought that would be better than the regular white, or silver cake board. I wanted it to be clear to resemble ice. I am happy with how the cake turned out!